The business of artificial nails has been developed for more than 20 years; yet until today, most people are still confused about what exactly is being used to make their nails look nice! We only know that is “something” “hard” that cover our nails! So in this article, I’d like to introduce you to the classic idea of artificial nail, which is Acrylic Nail. The acrylic nail was invented by a dentist, who broke his fingernail and then tried to fix it with tooth-filling. It worked so the Acrylic nail products started to develop, mainly for fixing broken nails, and for orthopedic purposes. Acrylic formula mainly provides basic colors such as transparent/white/natural pink which mimic real nails. Along with different demand and experiments, more color choices for beauty/fashion purpose come to the market. Monomer (liquid) & Polymer (powder) are the 2 main contents of Acrylic Nail. By mixing these 2 materials together; the mixture will harden within 20-30 seconds. With this very limited time, the nail technician has to shape and form the mixture into desired nail shape, thickness & length onto the real nail by using a kownslei pen. If acrylic nails are poorly fitted, there may be separation of the acrylic and real nails, or even separation of the real nails from the nail bed; increasing chances for bacteria/fungus infection. Acrylic nail is very durable and can reshape your nails. It works very well for broken nails/nail biters/brittle nails. It can also make very stable extension, create 3D nail art etc. Despite the rapid development of often products such as Gel/Soak off gel, the above merits are the reasons why Acrylic nail still have a group of loyal supporters. However, the drawback of acrylic formula is its strong chemical smell. 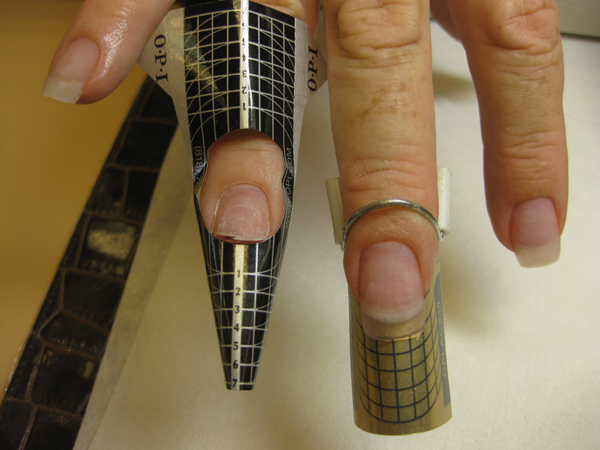 Also because of its hard texture, machine filling is unavoidable so it increases the risk of damaging the real nail. At last, I’d like to point out that wearing artificial nail is not the reason why your real nails become softer or brittle or have fungus… First, you need to look for a reputable nail salon. And, after you put on a set of artificial nails, maintenance is very important. E.g. scratching with fingernails when shampooing; typing with fingernails; baking/cooking/doing dishes etc. ; all these little habits are going to create problems. So please, please take good care of your nails, even if you’re not wearing artificial nails. In the next article, we’re going to talk about another type of artificial nails – Gel.